Although nozzles are some of the least expensive components of a sprayer, they hold a high value in their ability to influence sprayer performance. Nozzles meter the amount of liquid sprayed per unit area, controlling application rate, as well as variability of spray over the width of the sprayer boom. Nozzles also influence droplet size, affecting both target coverage and spray drift risk. Each nozzle type is designed for a specific type of target and application. For example, a nozzle designed for broadcast spraying is not good for spraying pesticides over a narrow band. Luckily, most nozzle manufacturers’ catalogs have charts showing which nozzle type will be best for a specific job. Check the websites of nozzle manufacturers to reach their catalogs. For more information, contact your county Extension office. Nozzle manufacturers’ catalogs provide tables and charts showing application rates (gallons per acre or gpa), given a nozzle’s flow rate (gallons per minute or gpm) delivered at various pressures (psi) and travel speeds (mph). These tables are useful tools for selecting the appropriate nozzles, pressure and speed to spray chemicals at application rates prescribed by product labels. However, the charts are only for a limited number of travel speed and nozzle spacing situations. 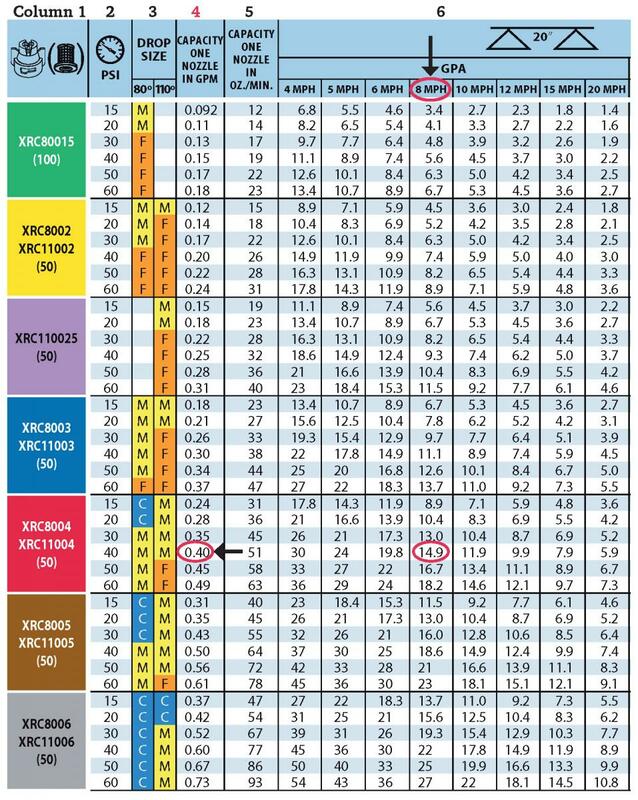 There may be situations where the charts will not provide information associated with your sprayer setup (nozzle spacing) and operating conditions (travel speed and spray pressure). The Apps developed by most of the major nozzle manufacturers can provide you the exact nozzle flow rate required for any given set of application parameters, and identify a specific set of nozzle recommendations for the given application parameters. To find these Apps, simply visit the App Store in your smart phone or tablet and do a search under “Spray Nozzle Calculator”, or some other key words related to nozzle size selection. You may also want to do a search under the name of the nozzle company from which you are interested in buying the nozzles. However, some Apps are not user friendly and sometimes they do not take into account the droplet size requirements when recommending nozzles. Although the Apps and tables in catalogs may expedite the nozzle size selection process, it is best to understand the procedure and the math nozzle manufacturers use to generate the values listed in tables and to recommend nozzles in their Apps. The procedure used by the nozzle manufacturers to generate numbers in tables and in their Apps is explained below. By following the steps mentioned below, you should be able to determine the exact nozzle flow rate (gpm) required for your spray application parameters. Once the exact nozzle flow rate is determined, you can then look at the catalog to select the nozzle that will provide you the flow rate at a practical pressure setting. Step 1. Select the application rate in gallons per acre (gpa). This is a management decision you will have to make based on pesticide label recommendations, field conditions and water supply. Step 2. Select a practical and safe ground speed in miles per hour (mph). Step 3. Determine the spray width per nozzle (W). For broadcast applications, W = nozzle spacing (distance between two nozzles on the boom) in inches. For band spraying, W = band width in inches. For directed spraying, W = row spacing in inches (or band width) divided by the number of nozzles per row (or band). (5940 is a constant to convert gpa, mph and inches to gpm). Step 5. Select a nozzle size from the manufacturer’s catalog that will give the flow rate (gpm) determined in Step 4 when the nozzle is operated within the recommended pressure range. If a nozzle of this size is not available, change the travel speed in the equation above and determine the new flow rate required. Now, we go to the nozzle catalog, and find a nozzle that will give us a flow rate of 0.4 gpm, while operating the sprayer at an applicable pressure and traveling at 8 mph. Catalogs have charts for each nozzle, similar to the one shown below. The first column gives the color code of the nozzle (which indicates flow rate), nozzle ID number, and the appropriate filter type for the nozzle. Column 2 gives the pressure range at which the nozzle should be operated. Column 3 gives the spray quality, a measure of spray droplet size (fine, medium, coarse, etc.) produced at different pressure settings. Columns 4 and 5 give the flow rate of nozzles in gallons per minute and ounces per minute, respectively, at different pressure settings. Column 6 gives gallons per acre application rate at different travel speed settings. First, we need to find the best type of nozzle for our application. In their catalog, the nozzle manufacturer recommends a flat-fan pattern type nozzle for broadcast application of pre-emergence herbicides. Then we find a chart associated with the nozzle type recommended. The chart shown happens to be for that type of a nozzle. Now we proceed with the process to determine the appropriate size of the nozzle. In this example, reducing the pressure to 25 psi alters the spray quality to “Coarse,” violating the label recommendation. The chart above indicates when using XRC11005, GPA₁ = 18.6 at 8 mph (MPH₁) at 40 psi. 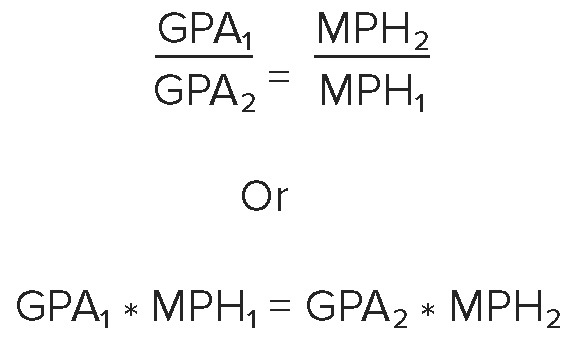 We want to find out what the new travel speed (MPH₂) should be to achieve 15 gpa (GPA₂). 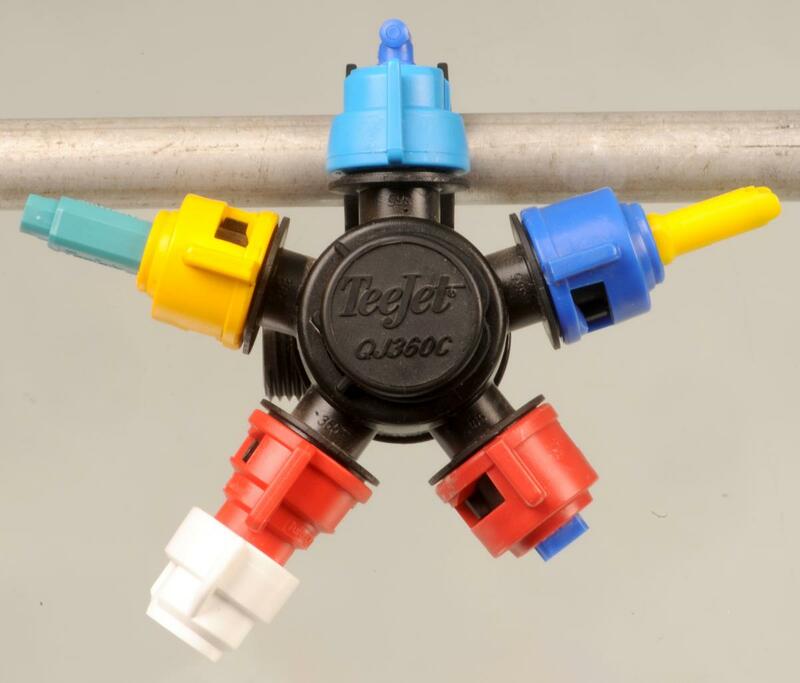 Selecting the right type and size of a nozzle is not sufficient to end up with accurate, effective and efficient application of chemicals sprayed. Changes in ground conditions (tilled, untilled, grass, wet, dry), and the topography of the field sprayed (flat, sloped) will affect the ground speed which is one of the variables used in determining the correct nozzle size. Nozzle orifices wear out with time causing larger flow rates and distorted spray patterns than when they were new. The gpm flow rate values given in catalogs or in Apps are based on spraying water only. Spraying solutions with higher densities than water (most spray solutions are) will affect the flow rates of nozzles at the same spray pressure. For the reasons mentioned above, sprayers should be calibrated frequently, especially when the field conditions change, to determine the actual application rate. Calibration is easy, and there are many ways to do it. Regardless of the method chosen, three measurements will be taken: actual ground speed, the distance between nozzles, and nozzle flow rate for a given length of time. One easy method is explained in an OSU Extension publication (FABE-520) listed in the references at the end of this publication. One of the major problems challenging pesticide applicators is spray drift, which is defined as movement of pesticides by wind from the application site to an off-target site. Drift is influenced by many factors which are discussed in detail in two OSU Extension publications (Bulletin 816 and FABE-525) listed in the references at the end of this publication. Equipment, especially the nozzles, used to spray pesticides play a significant role in generating as well as reducing spray drift. In nozzle catalogs, you can see a number of different nozzles of the same type, in terms of spray pattern. For example, one can find nozzles within the same “flat-fan” category classified as “low-drift.” Research conducted at Ohio State and elsewhere clearly indicate that nozzles labeled as “low-drift” significantly reduce spray drift as discussed in OSU Extension publication FABE-523 (listed in the references below). If drift is, or becomes a concern, it may be best to switch from a conventional flat-fan nozzle to a “low-drift” flat-fan nozzle with the same flow rate. Therefore, it is best to have more than one type of a “flat-fan” pattern nozzle on the boom. The author thanks Mary Griffith, Agriculture and Natural Resources Extension Educator, OSU Extension; Dr. Larry C. Brown, Professor and Extension Specialist, Department of Food, Agricultural and Biological Engineering, The Ohio State University; and Dr. Robert "Bobby" Grisso, Professor and Associate Director, Virginia Cooperative Extension, Virginia Tech University, Department of Biological Systems Engineering; for reviewing this publication and for their editorial contributions.